Holographic images that float in three dimensions are finally a reality you can touch, well wave your hand through anyway. 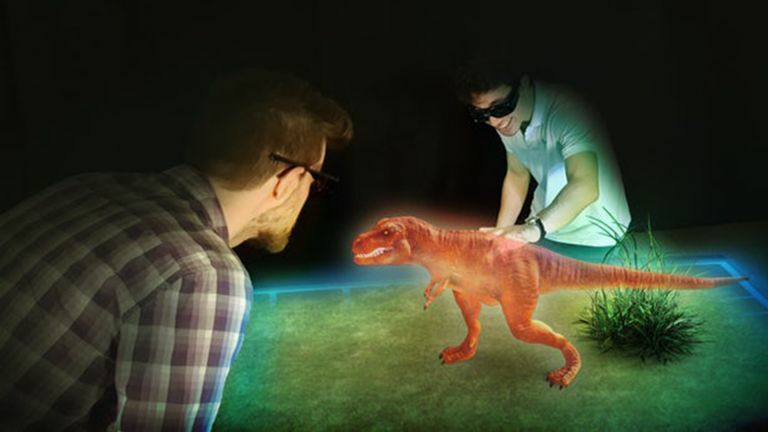 Aussie company Euclideon has created the first working prototype of its multi-user holographic table. This, in what it claims is a first, allows people to stand at different viewing angles to see the holographic images floating in the air before them. The catch is the users have to wear motion trackable glasses, although these are only thin things like 3D glasses you’ve probably tried before. Yup, no bulky VR or AR headsets needed. What you will need is the smart table with the multi projection holographic array built-in. These images are a little misleading as the hologram won't jump out where the screen isn't behind it. So where you see the dinosaur or building above the screen edge that's inaccurate - you'd need to duck down to see that clearly. The company reached notoriety after creating the Unlimited Detail 3D graphics engine for gaming, which crams immense detail into a system without putting strain on the processors. That applied here means potential for 3D modelling, presentations, object manipulation and, of course, gaming. The 1.5m by 1.5m table should sell for around £36,000. But there are plans for even larger holographic platforms that users can walk around on. Okay, now we’re getting into Tony stark territory. Expect to start seeing these hologram tables on sale from mid 2018.